On Sunday, 26 August, 2 groups of creatively talented students made the trek to UQ Campus, Gatton, to compete in the Toowoomba Regional Opti-MINDS event. 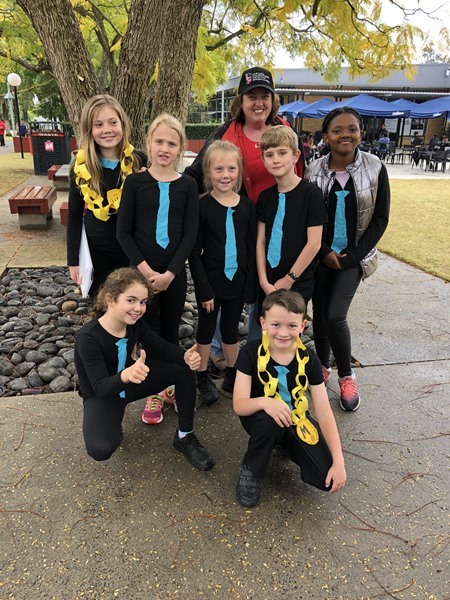 The Mech-anics comprised of Tom Clarke (Yr 2), Marlee Carpenter, Lucas Galligan (Yr 3), Heidi Reed, Elsie Irwin (Yr 4), Kago Mosako and Loretta Carpenter (Yr 5). Their challenge was to create a machine, The Mech 30, that could move a tin of tuna, an AA battery and a pingpong ball to trigger a celebration. It was hard! This team worked every lunch hour and some after-school sessions to build the machine and create a story explaining the historical significance of each of the items. The Matilda’s consisted of Vivi Vadasz, Ashleigh Hobson, Brooke Webb (Yr 10) and Laura May (Yr 11). These girls worked diligently to present “Waltzing With Matilda – 30 Years On…”, an altered version of Roald Dahl’s ‘Matilda’ that also addressed the issue of hard copy books versus digital copies. No easy task! At Gatton, both groups were judged on a spontaneous performance before presenting their challenges. The College is extremely proud of these students, especially as both teams came away with awards. The Mech-anics were recipients of The Spirit Of Opti-MINDS. There is a lengthy criterion for this award, based on the judges recommendations, but it includes “working consciously and with absolute integrity; working as a team showing effective communication; determining facts and eliminating assumptions.” When the variety of ages of the team members is considered, this achievement is something extra special. The Matilda’s WON their division in the regional event! This means they are off to the Queensland Opti-MINDS Challenge Final in October at UQ in Brisbane. The event is a 2-day event where the team will present another spontaneous and long term challenge. The College wishes them all the best. A big thanks to Mrs Morgan, Ms Rea, Mr Hobson and Ms O’Reilly for coordinating the teams, and Mrs Delitt and Mrs O’Brien who volunteered as judges for the whole day. Finally, thank you to the parents who enable extra practices and accompanied their children on the challenge day. Opti-MINDS gives students a great opportunity to extend their learning. It is hoped that we’ll have many more participants of all ages next year.